Storage units are not just for people who have run out of space to store their belongings in their home. They are also great options for people who are moving and need a space to store their property while in the middle of a move, or when deciding what is going to fit and look best in their new accommodations. 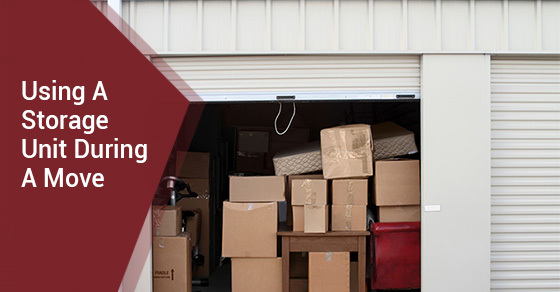 Below are some of the ways that a storage unit can make moving less stressful. Moving delays are not all that uncommon. If you are faced with an impromptu moving delay, having a self-storage unit already secured so that you are able to get your belongings out of your current place by the move-out date while you rearrange the moving logistics will save you a considerable amount of time and money. Having somewhere to store things that you don’t want to take with you, but don’t want to get rid of, will allow you to minimize the amount of moving and lifting that you have to do. Basically, a self-storage unit will save your back and make moving less of a hassle. Tentative plans can make moving incredibly stressful. Not knowing exactly where you are going, or for how long you will be there—especially for spur of the moment, work-related moves—can leave you scrambling at the last minute to find a place to store your belongings. A storage unit will let you keep your items in temporary storage, safe and secure, while you figure out where you are going and how long you will be there for. A self-storage unit allows you to place things in storage that you aren’t sure whether you are going to need, or want while you get your bearings in your new home. It’s hard to decide what to take, what will fit and what is ultimately going to match the aesthetic of your new home. Keeping it in a self-storage facility will remove the stress of having to make absolute decisions when you don’t have all of the information to make them. If you can get a lot of the heaving lifting and awkward objects out of your home into self-storage before your actual moving date, the things that remain will be easy to remove. This will save you time and expedite the move-out process, leaving you more time to make sure you have dotted all of the i’s and crossed all the t’s before moving on to the new place. A self-storage unit is a convenient way to make your move less stressful and less of a chore. No move is pleasant, but with some careful planning and a reliable and secure self-storage unit, you can give yourself more options before, on and after the move-out date and make settling into your new place as seamless as possible.